citizen has the right to bear arms. I know all this because I have just completed a four-day course at the Front Sight Firearms Training Institute in the Californian desert. This extraordinary organisation makes no concessions to the notion of shooting as a sport: its primary function is to teach its students how to win a gunfight, how to shoot another human with speed and efficiency. At a time when America is exhibiting increasing concern over the proliferation of guns, one might expect a school for gunfighters to be somewhat less than popular. Wrong. Attendances at Front Sight have increased by an average of 300 per cent every year. This year it estimates it will train six times as many students as last year. Indeed, the institute is so successful it is now in the process of building an entire resort town for gun lovers in Nevada, 50 miles from Las Vegas. To be called Front Sight, it has been described as a 'Shooter's Disneyland' and will offer residents 'everything you can imagine in firearms training in a setting that will appeal to the most discriminating tastes'. That will include no fewer than 13 different shooting ranges, nine live-fire simulators, a five-storey tower for practising SWAT tactics, a defensive driving track, an abseiling area and the so-called tunnels of terror — an underground network where residents can learn about defending themselves in 'a unique and extremely challenging tactical environment'. When Front Sight is completed next year, it will comprise 350 townhouses and 177 luxury homes, along with an armoury, a 'pro shop stocked for your convenience with street-proven products' (i.e. guns), an airstrip and a school specialising in martial arts. Streets will have names like Sense Of Duty Way, Trigger Avenue and Barrel Boulevard. Prices for a one- acre home site start at £130,000 and 31 lots have already been reserved. Front Sight is the brainchild of 39-year-old Dr. Ignatius Piazza, a former chiropractor who went through an epiphany some years ago when hoodlums drove through his middle-class Californian neighbourhood, shooting up the houses. Although he had been a gun collector, Piazza realised he didn't have any idea how to deal with such a situation and decided to do something about it. He trained with different weapons three or four hours every day and hired a shooting range every Saturday. 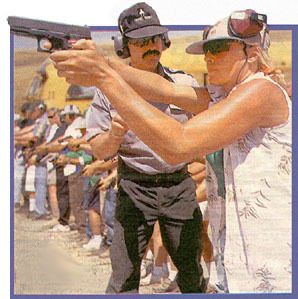 In 1993 he became only the second man in the world to qualify as a 'combat master' in four weapons — handguns, shotguns, rifles and sub-machine guns. 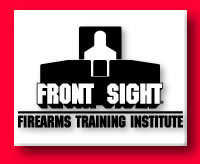 Three years later he sold his chiropractor business and launched Front Sight, which he now proudly describes as the world's leading firearms training institute. Its mission, he says, is 'to find and train the warrior in you'. I was not at all convinced there was a warrior in me so it was with some trepidation that I joined the 50 other students, mostly men, signing up for the defensive handgun course. Soon Front Sight will be moving to its new state-of-the-art facility in Nevada, but currently it operates from a commercial shooting range on the fringes of the desert in central California, 25 miles from Bakersfield. While all my fellow students were unashamed gun enthusiasts, they were far from the kind of beer-belly rednecks you find at gun shows. Predominantly middle-income, decent Americans, their motives for attending the course — it costs £600 and you have to supply your own ammunition —were mixed. Some clearly harboured apocalyptic views about social decay and talked darkly about needing to be ready; others simply wanted to hone their shooting skills. Many were attending their third and fourth course because they enjoyed it so much. Terry Thytens, a building contractor, and his pretty blonde wife, Diane, were perhaps typical. 'We have both carried guns in our cars for years,' he said. 'So we figured it was probably a good idea to learn how to use them. Each day began with a lecture from Dr. Piazza. He was dressed, like all the instructors, in starched combat fatigues and black lace-up boots, a pistol in a holster on his belt. He stood, hands behind his back, legs astride, and calmly talked about the moral and ethical decisions involved in shooting another human, and about the 'stopping power' of various bullets. He enlivened the lectures by acting out little scenarios. In one he played the role of a belligerent adversary who appeared to be reaching for a gun. He asked the students to put their hands up when they would shoot to defend themselves. Some people had their hands up before, whoops, he revealed he was reaching not for a gun but a mobile telephone. But out on the blistering range all the training was aimed at shooting before being killed. We were exhorted to develop a 'combat mindset', to be mad-dog mean when it comes to your life or your opponents' life. Students were advised they would need at least 800 rounds of ammunition to complete the course. It was no exaggeration: it seemed that when we were not blasting away at targets we were reloading magazines. Just to one side of the range were the combat training simulators where we had to shoot 'bad guys' as they popped out of windows or doors, but not kill the 'good guy' who was carrying an electric drill rather than a gun. Everyone took it all very seriously. Even though many of my fellow students privately admitted to a fervent hope they would never be called upon to use the skills they were being taught, none of them questioned the need for what they were doing. As the only Briton on the course and the only person present without my own gun (I had to borrow one from Piazza), I was the object of both curiosity and pity. Everyone wanted to know details about Britain's stringent gun laws and without exception they shook their heads at the folly of our legislators. To them, a society without guns was unimaginable. He was unapologetic when I put to him that a gunfighting school was distinctly at odds with a nation in anguish about the number of its citizens killed by guns and increasingly beset by doubts about the wisdom of the Second Amendment, which confers on all Americans the right to 'bear arms. 'Ninety per cent of the people who come here are concerned about their safety, due to the deterioration in society or whatever you want to call it, and want to become more skilled in the use of their weapons in the event that they have to defend themselves. Our philosophy is that the more training they have, the less likely that they will use their guns unnecessarily. 'There is a small percentage of people out there who are wired wrong internally, who cause 100 per cent of the problems. Piazza would make a persuasive spokesman for the gun lobby, although he recently got into hot water after the High School massacre in Littleton, Colorado, when he suggested teachers should be armed — and offered to provide free training. His proposal caused uproar, particularly among organisations calling for tighter gun control. 'It was a ludicrous idea,' said David Bernstein of the Centre To Prevent Handgun Violence. 'Teachers should be worried about getting homework in on time, not shoot-outs in the classroom. Piazza seemed genuinely puzzled by the furore. 'Every teacher knows that if some crazed individual comes into their school and starts shooting children, the only alternative they have is to hide the kids and wait. That is no place for anybody to be. But Piazza insists the resort will be a kind of paradise, and he certainly intends to move in with his wife and daughter as soon as he can. 'It will be a world-class facility, like the best golf resort but with shooting ranges instead of fairways,' he said.